I'm giving away 10 copies of an unedited electronic ARC (pdf) of DARK HARVEST, the second book in the Kismet Knight, Ph.D., Vampire Psychologist series. What is the name of the teenage client who introduces Kismet to the vampire underworld in THE VAMPIRE SHRINK? On June 15, 2008, I'll select 10 winners from the correct answers left as comments. Her name is Midnight. And yes, I went to the book to check before I posted a comment...! I hope I win! I would love to review the new book on my blog! Maybe we can do an interview? Her "name" was Mignight and she was a delightful characte. I have to step in here and say I have been lucky enough to see Dark Harvest and soon I believe you will all be jocyling to get a copy. Well done Lynda! What a wonderfully generous contest! I posted it over on the AuthorIsland.com More Contests page, too to help spread the word. Can't wait for this book to hit the shelves - any word on when it'll be, yet? Looking forward to seeing the cover, too - the cover for THE VAMPIRE SHRINK is incredible, so I'm sure they've done a wonderful job. You should post your news about the new covers for your Wild Rose Press books over on our AuthorIsland Author News blog, too - they're fabulous! Midnight. And after I went and read the excerpt and came to leave my comment - I went, "duh, I wouldn't have had to read the excerpt but I'm glad I did." Great premise for a book. I am gonna go out on a limb here and say her name was Midnight. The teen's name is Midnight. Found your Giveaway info at AuthorIsland - one of my FAVORITE sites! Thanks for the chance at the ARC. Thanks for the chance to read the new book early. I enjoyed The Vampire Shrink. I found out about your contest from your Myspace post. The client's name is Midnight. A new client who calls herself Midnight. Looks great, can't wait to read it!!!! The teenage client's name is Midnight. Thank you for running such a great contest and for giving so many of your fans a chance to read an ARC of DARK HARVEST. Midnight would be her name. 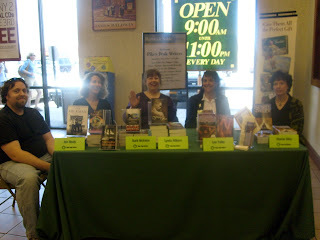 We met at your signing at the Centerra B&N. Oooohh! I just finished reading Vampire Shrink and was scouring your website for some morsel re: Dark Harvest. I am so glad I wandered over to your blog. I am dying to learn more about Devereux! Kismet's client's name is "Midnight". I cant wait to read Dark Harvest. Please enter me into the contest.